what. a. promise. He knows the plans and His plans are to prosper us! thank God! planting that in my heart is a a great way to start the year. God's plans are for us to prosper, to have a hope and a future. i want to own that promise! but i have to be proactive. i can't sit back and wait for prosperity to come to me. i have to take a look at the areas of my life that are deficient or hopeless or not leading to a good future. i have to commit to taking steps in a different direction. and i have to commit my plans to the Lord. // menu plan over the years i've discovered one area of planning that is often overlooked but is crucial to maintaining a healthy lifestyle: menu planning. planning my meals and my family's meals each week has hugely helped us stay on track, not only for eating healthy, but also for saving money and reducing dinner-time stress. here's how i do it: every saturday or sunday, i sit down at the kitchen table with my notebook. i keep a special notebook for random notes, grocery lists, and menu plans. i take that notebook with me everywhere, especially on my grocery shopping trip. once the menu is planned for the week, i make my grocery list, search for coupons, and load my Target Cartwheel app. (read 5 ways i save money at Target) then i go to Target and get our groceries for the week, sticking to the menu plan. for menu plans inspiration, i like to look on pinterest for meals with ingredients that i have on hand. menu planning is something i want to do better consistently. i've joined a group of friends on Facebook for accountability, and plan to email the week's menu to my husband. // exercise plan daily exercise is a necessary part of the equation to equal a healthier me. and a gym membership and all the home gym equipment on QVC is useless without a plan to actually use them. fortunately, i enjoy exercise. i like going to the gym like some girls like going shoe shopping. (i also like shoe shopping *smile) but it takes careful planning on my part to make sure going to the gym to exercise makes it on my daily to do list. here's how i do it: i found a few group exercise classes at my local gyms that are fun and provide a good workout- zumba and strength training. there is at least one class each day of the week that i can plan to go to if it fits in my schedule. at the beginning of the week, i plan which classes i can go to. i aim for at least 4 classes a week. on the days i don't make it to the gym, i plan to walk the dogs or have a dance party in my kitchen with the kids. they love my zumba playlist! going to the gym and exercising is good for my body but also good for my soul...it's good "me time" and i get to see several of my friends. the same meal planning accountability group holds me accountable for daily exercise. i highly recommend finding an accountability partner or group! // illness prevention plan eating right and exercising frequently will help my body stay healthy. but i still need to be careful to protect myself from germs and illnesses. we don't live in a bubble. my kids are around other children at the gym, in their dance and martial arts classes, and at our homeschool co-op. we could pick up germs from any public place we go, and my husband could unwittingly bring germs home with him from work. i can be intentional about protecting my family from catching illnesses when we are exposed, and preventing illnesses from spreading or progressing. here's how i do it: i take a daily multivitamin. we drink lots of water and eat healthy. i carry an alcohol-free hand-sanitizer with me at all times, plus i keep a package of wet wipes in the car. i also keep young living essential oils on hand to relieve any symptoms- like peppermint for a headache, lavender for an ear ache. at home, i diffuse antioxident, immune-enhancing oils like lemon and oregano. i bought the Young Living Premier Starter Kit and consider it an investment in our wellness. // God's plans knowing God's plans for me help me stay on track and not lose hope. i can look at my to do list and my days ahead knowing that God is in control and already has it all planned out for me. i can trust Him. i can take every decision and every worry and every fear and every dream to Him. knowing God's plans keeps my mind and emotions in check, and contributes to a healthier me. here's how i do it: i read my bible. the bible has all of God's promises and plans, plus true stories of people who have trusted God with their lives and set examples for us. every morning, i read a page in my Jesus Calling devotional and spend time praying and journaling. there are some really great online guides to reading the bible every day, and some fantastic online devotionals that will go straight to your email inbox every morning. i shared some of my favorite resources and wrote about my morning quiet time habit here. i consider daily QT w/ JC essential to my overall health and well-being. this year i plan to continue studying the Word and lining up my plans with God's plans. 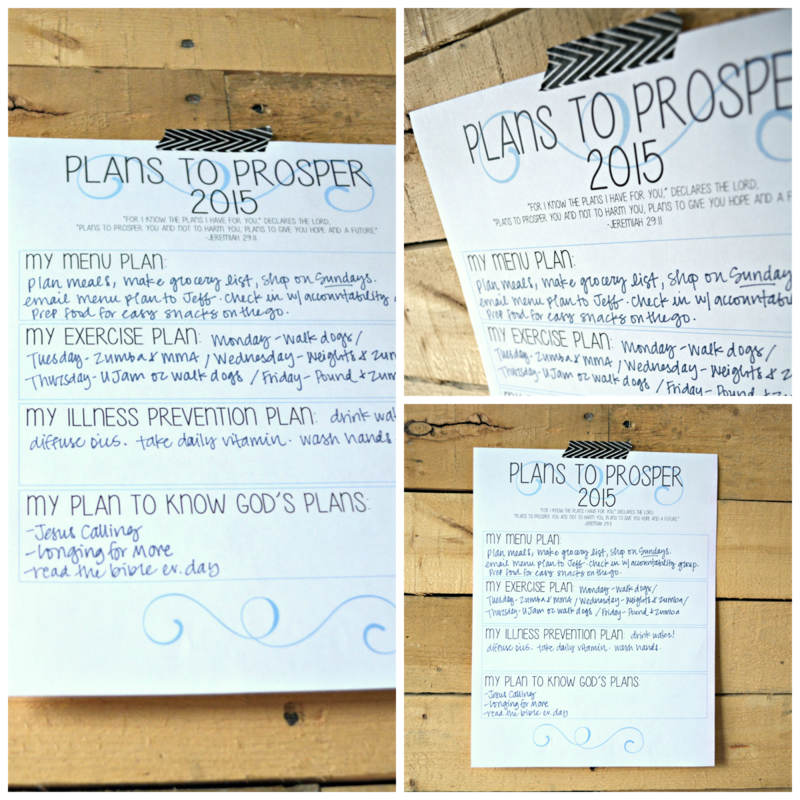 i wrote this all out as a visual reminder of my plans for a prosperous healthy year. Lord, help me believe Your Sovereign plans to prosper me, to give me a hope and future. guide me in Your wisdom and Truth. i commit all of my plans to You. 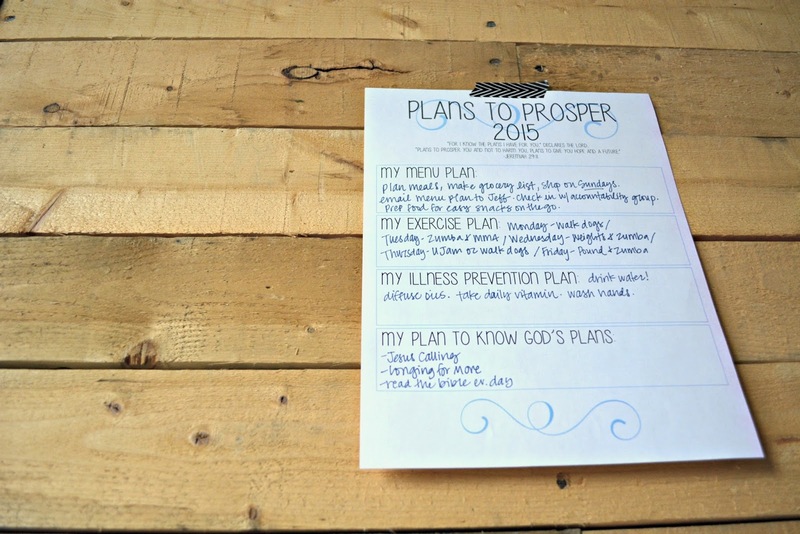 plant Your jeremiah 29:11 promise in my heart, and help me live this year intentionally following You. 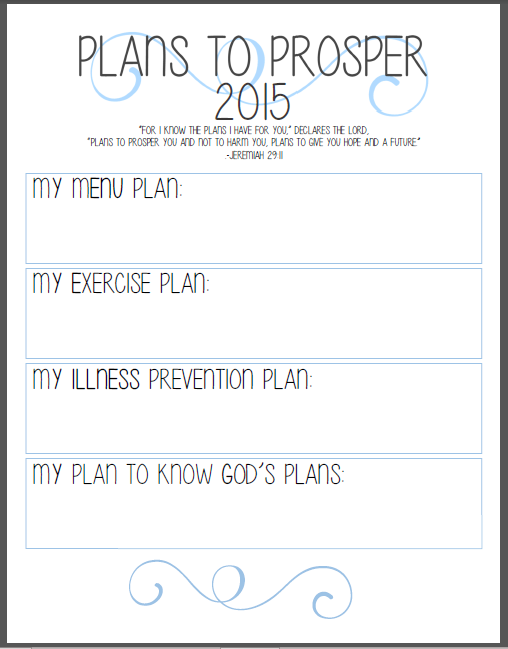 praying your 2015 is God-planned, prosperous, and healthy, friends!